If the broad goals of international development are similar across all nations, and with the knowledge that the participatory, people-centred approach it takes in working with communities is applicable in developed as well as developing countries, then it’s only natural that TerraCircle has become involved in community development in Australia just as it has in the Solomon Islands. Believing that a good place to start develping practical, achievable and desirable solutions to sustainable living is where you live-as well as believing that by sharing our skills and resources we can help others achieve a sufficiency in their basic and higher level needs (a ‘distribution of surplus’, ‘fairshare’ principle), the volume of Australia-based work engaging TerraCircle consultants has steadily increased in recent times. 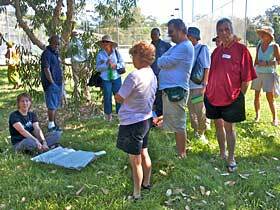 compost-making workshop for Ku-ring-gai Council. TerraCircle acts on the dictum of Bill Mollison and David Holmgren (developers of the permaculture design system in which a number of TerraCircle people are qualified as practitioners) to work where it counts and to work with those who want to learn. To enact this, TerraCircle takes a collaborarive approach to its work in Australia, cooperating with community organisations and local government to help them develop solutions that meet the needs of both, that improves neighbourhood environments, increase local opportunity and contributes to liveable, sustainable cities.